New competition gives business owners a chance to win funding. It’s that time of year again. The application period has officially opened for the Catapult Small Business Competition. Current and budding entrepreneurs from across the Thumb Region are being encouraged to apply in the business pitch contest. Participating counties include Genesee, Huron, Lapeer, Sanilac, Shiawassee, St. Clair, and Tuscola. Each county within the region will have its own contest. The county winners will then convene for the regional summit where they will then compete against each other. "We’re excited to bring this competition to entrepreneurs in the region once again," says Dan Casey, CEO of the Economic Development Alliance of St. Clair County. "Last year’s regional winner, Smart Shelf LLC, has successfully launched its business due to the support and grant funds it received. We think that all of the competitors will benefit from the support they receive, so I encourage entrepreneurs to take advantage of this opportunity." At the county level, winning business pitches will receive $2,000 for first place and $1,000 for second place. The I-69 Thumb Regional Summit will award $5,000 for first place, $3,000 for second place, and $1,000 for third place. 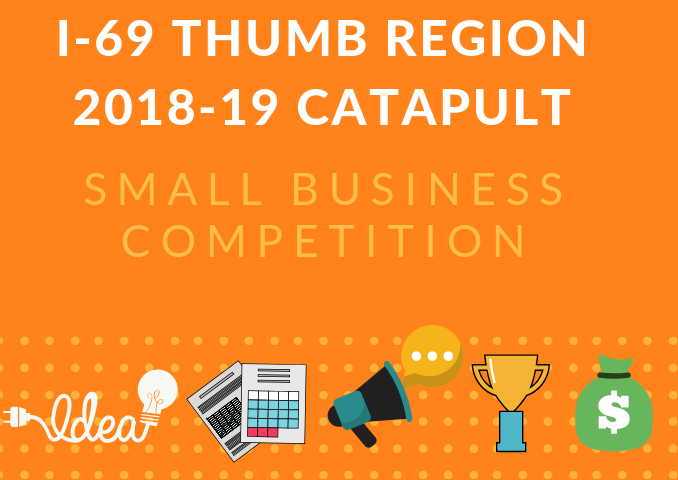 To compete, a small business must be located within one of the seven Thumb Region counties and have an existing small business or plan on opening one within the next six months. The competition defines a small business as a company with less than 20 employees and an existing revenue of less than $400,000. Visit the Catapult Small Business Competition online to apply.